That was my thought about the Wtaer Taxi - it was a little pricey, and if you have a group of four (wife and kids), it gets real expensive real fast. Right, especially since from National Harbor you're 12 minutes from parking for $15 across the street from the home plate entrance. 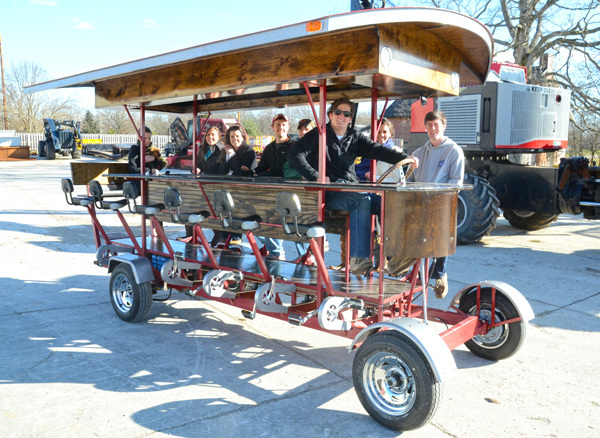 Here's what we really need, a pedal wagon, ride with 15 other fans to the park on a rolling bar. One of the Capitol Hill bars would be wise to buy one of these bikes, slap their logo all over it, and serve up the suds on the way to and from the game. I would definitely do that for free beer. One of the bars has a six-seat pedicab. This is way cooler though. The General Manager’s operating budget projects $66 million in new revenue from fare changes that will be the subject of public hearings in February and March. In addition to generating revenue to balance the budget, the proposed series of fare adjustments are designed to simplify the fare structure; create more user-friendly fares for out-of-town visitors and occasional riders; encourage the use of SmarTrip cards; and improve boarding time on bus for cash fares. Set the maximum off-peak fare at $3.50. The proposal also includes a 25-cent increase in parking fees, rebalances the number of reserved parking permits, and decreases the bike locker rental fee to $120 annually. MetroAccess fares would be adjusted commensurate with rail and bus increases, with a maximum of $7.40 per trip. Going to Nats games would be Peak going there and non-peak going home. Weekends would be all non-peak. I'd be much more interested if it was a Keg Bus. Granted the only time I seem to get out to the burbs is for a crazy house party. I read on Facebook they will have a bus from Velocity in CENTREVILLE! AWSOME! Anyone see what their pricing looks like yet? Yep. I feel like it needs to be not more than the metro for me to feel like it's justified using it. I know it's a bit more convenient and fewer people use it, so that means it won't be equal to or cheaper than the metro. Does anyone know if it's available for EVERY home game? From the western suburbs, it costs $4.50 to park at Metro, then roughly $8.00 (rounding up slightly) for roundtrip fare. That'll be my baseline - if it's much more expensive than Metro round trip, I'll be hesitant to use it. It sounds like a really good concept, so I hope it works out. I imagine they will have to have more than one bus. I can't imagine a bus leaving Dulles Town Centre, going down 28 to Centreville (a horrible mess during evening rush hour), than in on 66 with a stop in Ballston en route. Does anyone know if there are more stops to be announced? I typically pay $12-13 round trip plus parking each time I visit Nats Park. I can't really see myself spending more than $15 for a bus, plus often times bus drivers expect tips, that raises the cost even more. I suspect they will have separate buses for each stop. And you won't have to tip, I bet. Cost would have to be competitive with Metro but I would pay a bit more for the convenience. I think that the fun factor is the bigger selling point over convenience. It does sound like they will have separate buses for each stop, although for a place like Arlington they may want to consider making two or three stops along the Orange line corridor, and even for the other stops further out they may find it easier to fill the buses if they make more than one stop. I'd be a big fan of taking a bus if I lived close enough to a stop where I could walk home. It's great that they are getting this going, but are these the only options for the forseeable future? They're all in the Western direction, how about South, or North into MD? They are planning based on response to their surveys. Vote for the corridor you'd be interested in traveling in from. I missed the survey, is there a link? Yeah, it's buried in their facebook page. They ask a question every week or so it seems. I think they are planning on a bus from Hagersburg as soon as they can find it on the map.